This sleepy little town, nestled comfortably along Oahu’s North Shore, is the polar opposite of the busy cityscape of Waikiki. More than a hundred years ago, entrepreneur Benjamin J. Dillingham opened one of the first hotels in Hawaii. He named the lodge Haleiwa, its literal translation meaning “House of the Iwa”. The graceful frigate bird, he said, best exemplified the ambience he wanted to create for the hotel. At that time Haleiwa was in the middle of nowhere. Dillingham’s plan was to start a new railroad connecting his sugar plantations in Waialua to Honolulu. The Haleiwa would be the railroad’s last stop. 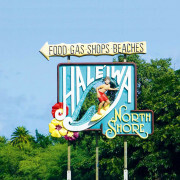 For years and years tourists and locals alike enjoyed vacationing at The Haleiwa. Eventually, the entire town adopted the name. The hotel is gone now, but this old plantation town continues to welcome visitors. Designated a Historic, Cultural and Scenic District in 1984, Haleiwa Town has maintained its simple charm and laidback environment with aging storefronts lining its main street. This is definitely a “shorts and slippers” kind of place. Haleiwa offers a nice selection of surf shops, art galleries and eateries, all of which are in addition to the beautiful beaches and world renowned surf spots (Vans Triple Crown). Whether you’re spending a week on the North Shore or just a day, Haleiwa is a must. Make sure to plan a visit and don’t forget to stop by the Big Wave Shrimp truck to fuel up for your adventure!